There is no doubt that NYC Pedicab advertising can bring much positive attention to your company logo or message in New York City. What could be a better form of advertisement than having the name of your company flashed around Times Square, NY? Millions will see it, whether they are in Soho, outside a Broadway theater or relaxing at Central Park. 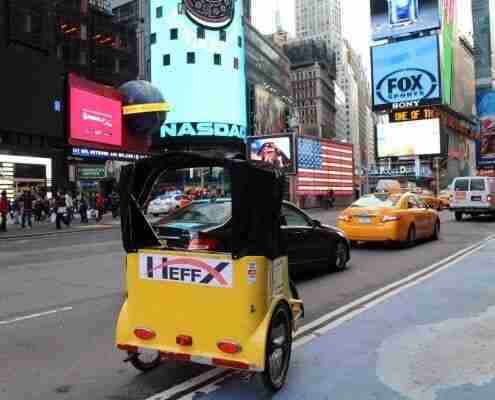 Choosing to advertise on a pedicab in NYC is beneficial for your company because your message follows the audience. Placing your message on a bus shelter or billboard is fine, but the novelty and mobility of a pedicab remain unmatched. You cannot beat our level of exposure and recognition. We have very competitive pedicab advertising rates and we would love the opportunity to prepare an estimate for your next pedicab outdoor campaign. Our New York Pedicab advertising rates are custom tailored and are quoted for monthly, weekly, daily, seasonal and off-season campaigns !